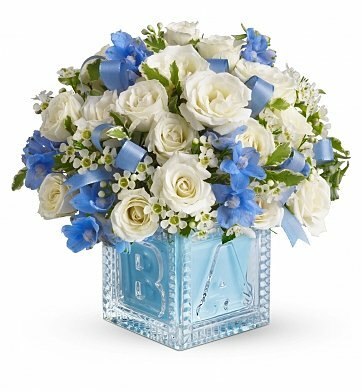 Celebrate the arrival of a new baby boy with this charming blue and white bouquet that arrives in a unique baby-themed vase. Sweet flowers such as spray roses, delphinium, and waxflower are arranged in a blue keepsake vase that can later be used for display or storage in the nursery. Accented with blue ribbon for a finishing touch, the arrangement is a lovely gift to express your congratulations. Note: "Better" and "Best" versions include yellow gerbera daisies, not pictured. Arrives in a keepsake block vase. Baby Boy's First Block is a hand delivered gift. These gifts are delivered by one of our local design centers located throughout the United States and Canada. Same day delivery is available for most gifts when ordered before the cutoff time. The cutoff time for Baby Boy's First Block is in the recipient's time zone. The recipient said it was beautiful. Pleasant color combination ideal for a baby boy. Great price and delivered on time. I didn't see this flower arrangement, but was told it was very nice and the block was very cute. It was delivered on time, same day that I ordered it. It went directly to the hospital before he was even born! From the person who received the flowers: The arrangement is gorgeous and they smell like spring, which will hopefully be here soon! I can't really review the gift because I didn't see it. However, I was very impressed with the GiftTree staff. My niece, who just had her first baby, lives in the country. The local florist didn't have the glass block vase for the arrangement so a GiftTree staffer called me to ask about an appropriate substitution. I was able to go online to see her suggestion (little wagon) and I agreed that this was fine. Then, because my niece lives 'out there', the GiftTree folks called me to let me know about a very slight delay in delivery. They offered to upgrade the gift to make up for the delay. When the flowers arrived the next day, my niece was totally thrilled!!! So even though I didn't see them, I'm sure the arrangement was wonderful. As a consumer, the professionalism and courtesy from the GiftTree staff made me decide that I'll definitely use GiftTree.com again.